I love all the cliche seasonal activities; from sledding and sipping hot cocoa to decorating gingerbread houses and picking out a Christmas tree…count me in for ALL the holiday fun! We are lucky enough to live about 10 minutes from a Christmas tree farm, so last weekend we bundled up and headed over for Opening Day. I felt as though I was in a Hallmark Christmas movie! Everyone in their Santa hats, red and green colors everywhere you looked, puppies in sweaters, candy canes and hot chocolate being handed out…it was so much fun. Anyone leaving that tree farm NOT in the Christmas spirit was most definitely a Scrooge! You are the cutest and now you have me thinking about candy canes!! I can’t WAIT to take Lila to a Christmas tree farm next year since we’ll be home sweet home! Sounds like you had a blast! 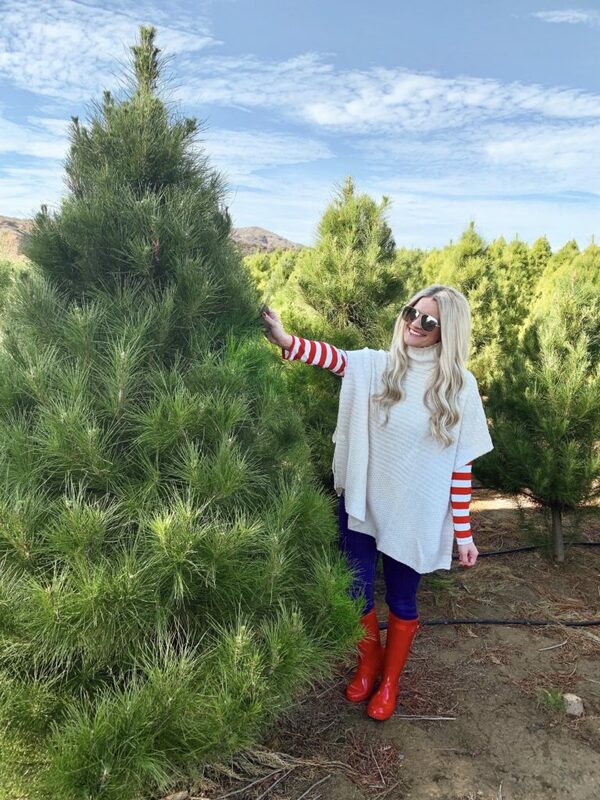 What a cute outfit for picking out your Christmas tree! And so lucky to have a Christmas tree farm so close to your house. Unfortunately, I am allergic to real Christmas trees (which makes Richard mad every year!) so it’s artificial for us! But so fun to see everyone in the holiday spirit. It really is the most wonderful time of the year! Hope you guys had a great Thanksgiving, Shauna! Love this cute and casual look! The candy cane stripes are so festive! I, for one, adore your Christmas spirit, all the excitement just like me!! 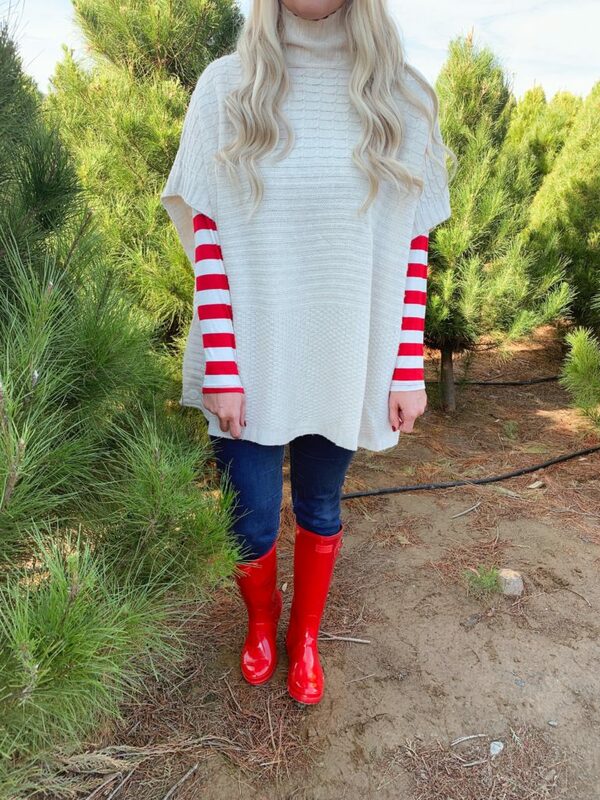 And lets talk about these stripes and the poncho goodness, the prettiest girl at the tree farm I am sure of it!! Happy Monday doll! A Christmas tree farm, how fun!! What gorgeous and festive photos these are, I love your red and white striped top!! You’re the cutest! Can’t believe xmas is right around the corner! Love the colour combo- those stripes are awesome. This has to be the cutest outfit I have seen lately, super lovely! I like your boots, dear! Have a nice week! I love your outfit! It’s so fun and festive! We need to go cut a tree down soon! Love your Christmas spirit babe!!! I love Xmas time! You are just the cutest! 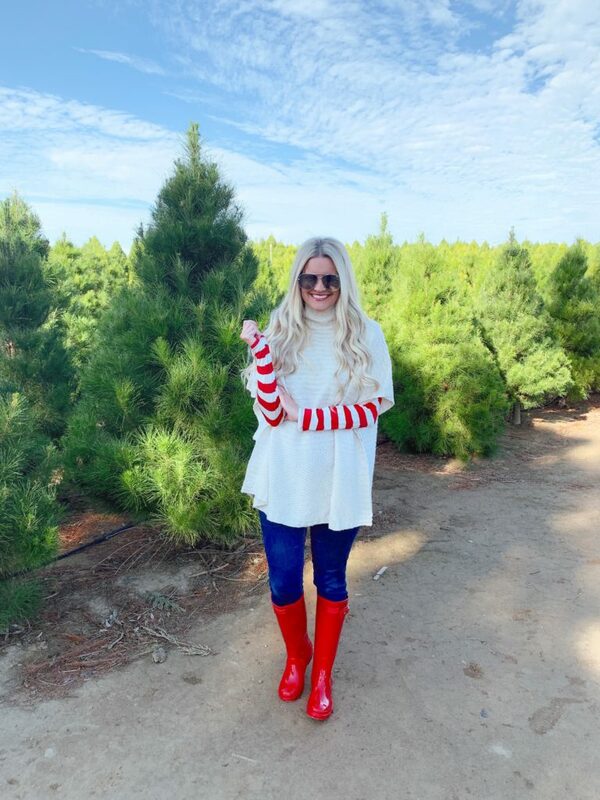 Love this festive look and how fun is it to pick out your Christmas tree! Yay!! Oh how fun! We have a christmas tree farm we are going to next weekend! It’s the same one I went to as a little girl. It’s so much fun and I can’t wait! this years christmas look like it gonn be so much fun. You look so cute girl! 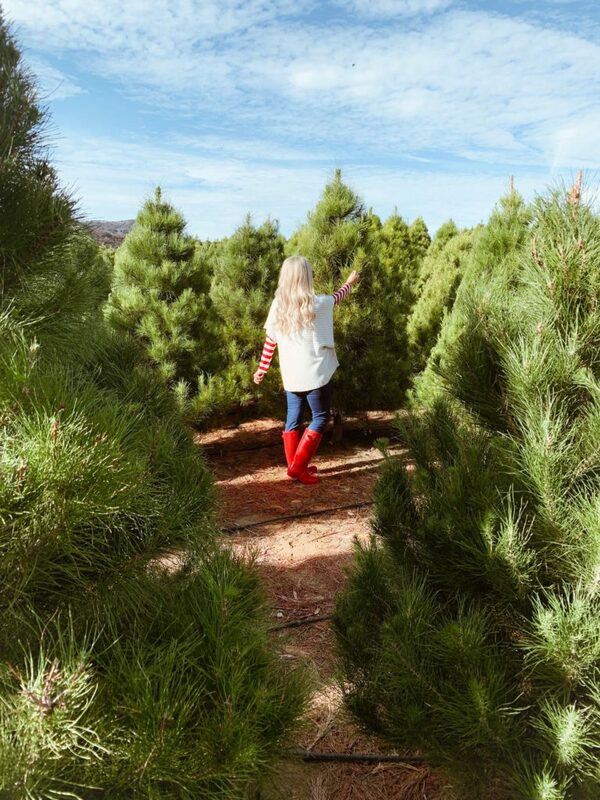 The Christmas tree farm sounds like so much fun! We have them here too but with lots of snow on the ground and way cooler temps. lol! However, the best part about the holidays is getting to pick out your own Christmas tree. So fun! This is the cutest! What a perfect outfit for picking out your tree! I am so happy that you’re rockin’ this poncho. 🙂 I was digging around in my closet last week looking for something warm and came across one that looks almost exactly like this. I went back and forth over whether or not I should give it away since it hasn’t seen a lot of love recently. I decided, what the heck!? I’m going to wash it and wear it because I love it! You’re always the cutest so I now feel justified in rockin’ my own poncho! love the stripes of red under you sweater poncho! super cute look! What a perfect look for tree hunting – it’s probably not too big a deal where you are, but I was schlepping through the mud over the weekend at the tree farm and wished I’d had on rubber boots! You are too cute! I love the bright striped tee under your poncho! It’s so fun and festive! I love the outfit.The striped top looks amazing under the poncho. Ok you are just the cutest! 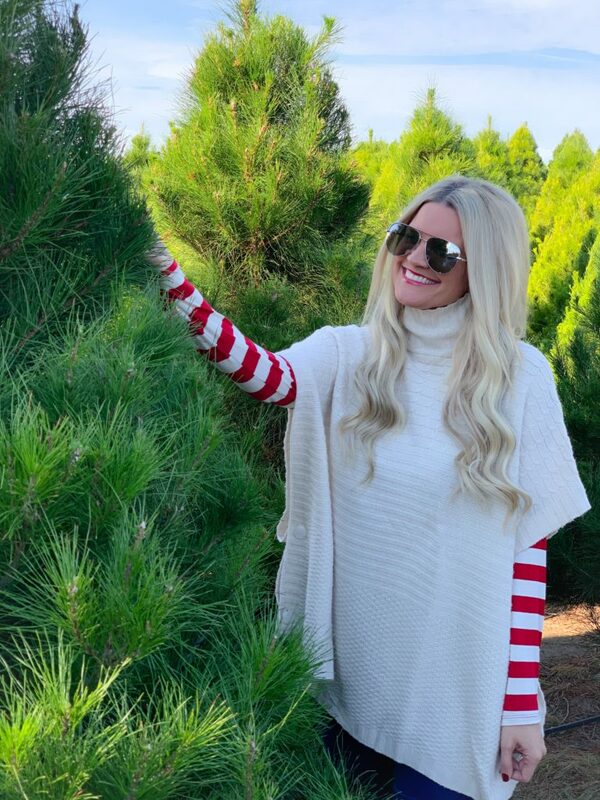 I love the pops of red–so festive and perfect for picking out a tree! So cute with your red boots!! Yep. Totally resembles a Christmas Hallmark movie and I love it all too. Your red and white outfit is adorable and reminds me of candy canes, in the best way possible. You’re Santa’s little helper in this look! Love those festive stripes peeking out! 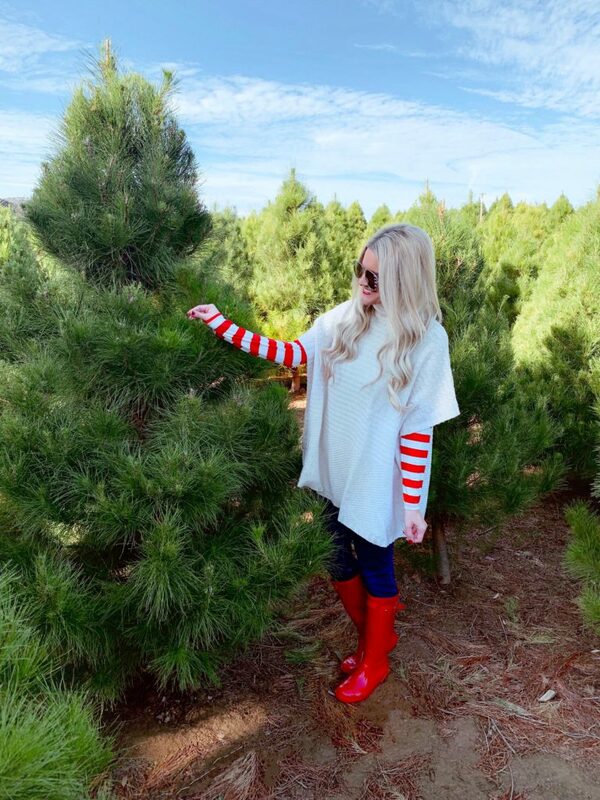 Your outfit is so perfect for Christmas Tree picking and those boots are so cute! Such a cute and cozy Holiday style! We used to live next door to a Christmas Tree farm, talk about convenient! I love all the Holiday activities too! This is such an adorable look on you dear! So cozy and cute. Love the pop of reds from the outfit!